Slice tomatoes into quarter - half inch slices. Mix flour, salt and 2 tsp black pepper until well combined. Dredge each tomato slice in flour until well coated. Beat eggs and milk together until well incorporated. Mix cornmeal and pepper together. 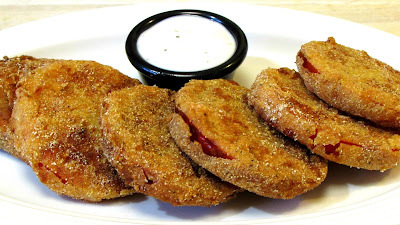 Dip tomatoes into egg mixture and then into the cornmeal until well coated. Place into the refrigerator for 30 minutes for best results before frying. Carefully drop tomato slices into 350º oil and fry for 3-4 minutes, flipping at the half way point. Drain tomatoes on wire racks and sprinkle with salt.